Hadn't posted this over here yet, but I took the Deerslayer rebuild and after some more mods, took her racing. Longish blog post about it here, and a couple of pictures below to pique interest. Good day racing, but unfortunately the SH being a liquid-cooled, 4-valve twin, I'm able to run in the combined Thunderbike / Super Twins class, but otherwise have to jump up to unlimited Supersport, Superbike, and GP. Not exactly a sporting chance there considering I give up some 50hp on the older 1k I-4s, and over 90hp to the AMA-spec S1000RR BMWs running around in that class. 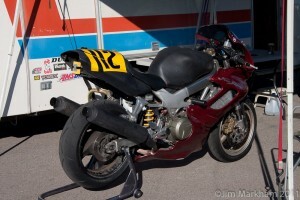 Guess I need to pick up a baby Monster or a SV650 to keep running in the lightweight classes. Looks like a big track! Some nice knee-dragging you have going there. Cool info. I'd love to race some day, but have no illusions that I'm fast enough to consider it. Glad you had fun! There's plenty of really slow guys out there old yeller, main thing is to be consistent with your line and allow space for the faster guys to pass. If your an old fart like me, (over 40), they have classws for us that aren't as cut throat. Yeah its strange in NJ I am competetive in formula 40 (over 40) but in NH there are alot of crazy fast guys in it. Kind of like WSBK with older guys winning. What track did you race at? I'd need an older farts over 50 class! that's awesome!!! So how did you do in the race? 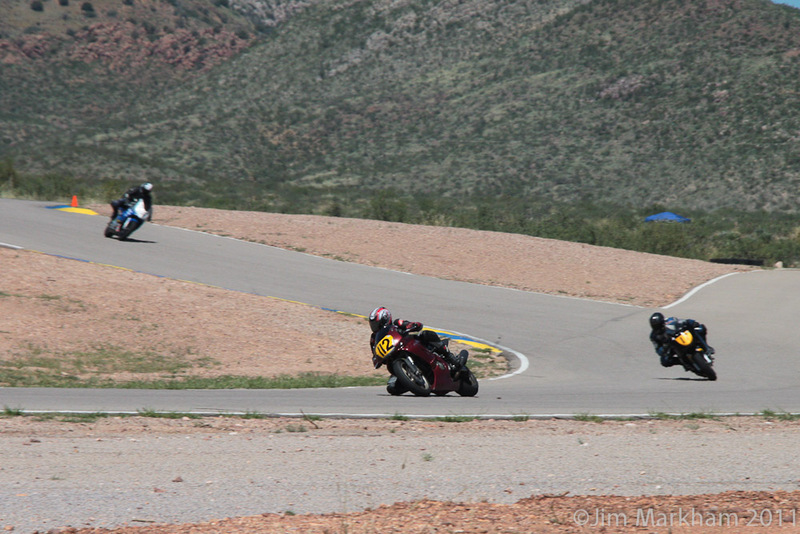 I just started racing this year too, there was a superhawk on the track with me at the same time (in a different race class) I battled him a few laps on my FZR600. I'm hoping to get my Superhawk track worthy this winter and maybe race it next year. They actually run a formula 50 class at Loudon too. But again, I always recommend a lightweight bike. Too true, my buddy races a fz400 and he only uses 1-2 sets of tires a season! I can use that on the Hawk in 2 track day weekends easily. Red, I've never scraped my pipes at the track in 2+ years of riding. I'm thinking your friend should perhaps double check his install to be sure. One easy way is to lean the bike manually while standing still and see what touches first. In galaxie's case, with the extra clearance of the lower cover, I could see it touching because it interferes with the clearance just a bit. I don't run a lower on mine. I used to scrape the crap out of my cans at a good lean when they were in the stock low mount position. No problem with high mount cans but then I burnt the inside heals of my boots! The fix was low mount mid pipes with high mount hangers so the exhaust was swept up similar to an RC51. Hope this helps. Oh and with the sharkskins lower on I have scraped the right side where it bulges,(very lightly), but never the naked pipe. Good point Super. I have only run high mounts on mine. perhaps that's why I've not experienced it. Hey, Old Yeller & Superhawk22 thanks for all the great info, very helpful and will save me tons of "R&D" on & off-track! I'll get on eBay over the winter (lots of that up here!! ) and get what I need. 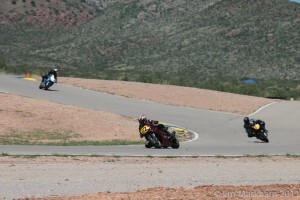 98VTRrider: I managed 3rd in the Thunderbike race, and got DQ'd from the lightweight superbike race. I entered knowing the bike isn't class legal, but expecting to be able to dice it up with the guys at the back of the pack. Someone was apparently vying for regional championship points, and so they protested. Meh. Red Devil / Old Yeller: The header pipe 'bulge' on the lower fairing is the only thing I had clearance issues with. I dragged my toes a couple of times, and could hear the fairing scraping in one corner in particular, but it didn't do it when I went faster and hung off farther, and didn't really mess with the pipe underneath either. For reference, I'm running '01 GSXR-750 forks in 954 triples, which end up dropping the front end 6mm. It's not a lot, but from what I remember other track guys saying on this forum in the past, I'm experiencing the same clearance issues that they've had when running the front end slightly lower. I have to run the lower due to oil-catch pan rules for racing. Never scraped the pipe when doing trackdays before. As for a lightweight bike, I'm probably going to end up selling the Superhawk when I deploy this spring, and try to find a SV650 to race once I get back. She's kinda past the point of no return for streetability, and I may end up on another street hawk in the future, but if I'm going to have any chance of competing in the lightweight SS/SB/GP classes, the SV is where it's at. Technically, a 1000cc Ducati Monster S2R meets class specifications since it's air-cooled, but racing that would really, really expensive. Quick Reply: I went racing!